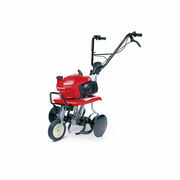 With the light weight Honda Tiller F220 it is the perfect tool for the gardening professional or domestic user alike. Honda's F220 features a mid-tine configuration that delivers the perfect balance of power and manoeuvrability to ensure that you can use your tiller in almost any environment. 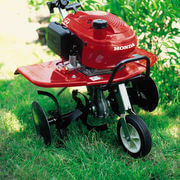 Honda's great mini 4-stroke engines that deliver more power and use less oil making plowing so much easier. Being equipped with auto-decompression, electronic ignition and anti-flood primer system ensuring your tiller starts first time. 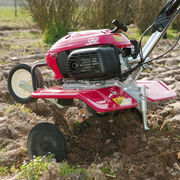 The F220 runs on unleaded fuel, meaning no fuel mixing with oil removing unwanted hassles and producing a more environmental friendly machine. And as usual Honda put your mind to ease by providing a 4 year domestic warranty and 1 year commercial warranty. 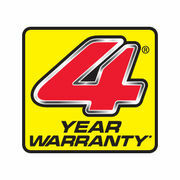 4 year domestic warranty, 1 year commercial warranty.